Since GolfBuddy World Platinum comes from one of the most respected names in the manufacture and distribution of golf equipment then you can rightfully expect to get many benefits when using it. And it does not disappoint since it comes packed with many features but the greatest benefit that you will get from using World Platinum is increased club distance measurement accuracy. Golf Buddy has been in business for many years, and in this time, they have set the bar very high in the manufacture and distribution of golf equipment. And so every time they release any device golfers only expect top notch quality and performance. This was the case for me when I went out to buy the World Platinum GPS, and I was not disappointed as I got way much more than I even expected. Looking at this GPS device, it looks just like any other standard handheld golf GPS especially those from Golf Buddy. However, when you get to use it, you will realize that it is probably one of the best currently on the market. Personally, what I liked most about it is that it calculates the distance you hit with each club and hence it will advise you on the club to use based on this distance. I found this very helpful since I do not have to waste time choosing the right club. Screen: It has a bright LCD screen with a high resolution and good size. The screen is also full-color and is clearly visible outdoors. Score Tracking: Can keep track of scores for up to four players and calculates the distance that you hit with each club. Battery and Housing: A rechargeable lithium-ion battery powers the World Platinum, and it has a shock and waterproof housing. Preloaded Courses: It is preloaded with 32,000 international golf courses, but it can accommodate up to 40,000. Auto Course Recognition: It finds the course that you are playing on automatically and once you turn it on it will determine the course and be ready for the game long before you get to the first tee. Statistics Analysis: This is an incredible feature that allows you to keep scores, fairway hit, sand saves and putts. The score module comes in handy in tracking statistics and as a score card. Green View/Pin Placement: With this feature you place the pin to conform to the exact shape of the course you are playing on. Touch Screen Control: The touch screen makes it a modern GPS that is easy and convenient to use, but you should not expect it to respond as fast as a phone. It also has a Zoom (in and out) function for better readability. Since this device comes from one of the most respected names in the manufacture and distribution of golf equipment then you can rightfully expect to get many benefits when using it. And it does not disappoint since it comes packed with many features but the greatest benefit that you will get from using World Platinum is increased club distance measurement accuracy. Of all the GPS rangefinders that I have ever used this is by far the most accurate one. The accuracy is also consistent as you can be assured of accurate measurements on every shot. Apart from the touchscreen, there are also some physical buttons to make navigation easier, convenient and faster for a golfer. Distances are spot on, and you will probably not find anything with a better accuracy than this especially those in the same price range or cheaper. There are no annual fees for anything whether it is syncing, updating or downloading new courses and so all that you pay for is the price of the GPS. It fits comfortably on the hand thanks to its ergonomic design and at a weight of 5.65oz; it is also light to carry. Just like with most handheld Golf GPS most customers complain about the touchscreen sensitivity. The screen on this GPS is not bright enough or at least as bright as other more advanced and so it difficult to see data under sunlight. There is varied consistency in different courses regarding the amount of data provided. 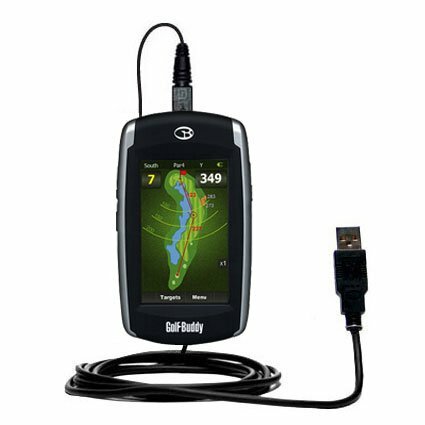 Overall this is one the best Golf GPS device currently available on the market, and it is a significant improvement of the previous editions from GolfBuddy. Although there are others from different manufacturers with slightly better features, they are way more expensive than this. There are also no fees, and it comes with many preloaded courses, and so it will give you great value for the money spent. And so this is a good option for any golfer whether they are starting off or are seasoned players.